Chicago -- America's third largest metropolis -- has 117 miles of on-street bike lanes, more than 30 miles of marked shared lanes and dozens of miles of off-street paths. Along with established or in-the-works bike shares, our Top 10 Cities for Cycling, all with populations over 100,000, feature an abundance of great rental shops, municipal bike racks, exciting trails, and dedicated bike lanes. Katie Adamson of Visit Denver says that the 300,000 rides logged during the two-year (and counting) lifespan of Denver’s bike-share program have translated into 13.5 million burned calories, a $990,000 savings on gas and parking, and 1.1 million pounds of greenhouse gases avoided. Yep, biking is good for our health, our pocketbooks and our planet. And as you’ll see, it actually looks like fun. Home to seven-time Tour de France winner Lance Armstrong, Austin is a bike lover’s mecca: The city estimates that more than 6,000 people ride bikes here each day. The Lance Armstrong Bikeway will soon connect East and West Austin with a dedicated bike path for the first time (4.6 miles of the planned 6-mile path is now complete), and the Barton Creek Greenbelt offers a 7-mile mountain biking trail right in the heart of the city. These are just two of the reasons Austin is recognized as a Bicycle Friendly Community by the League of American Bicyclists. “The city has earned this prestigious spot by excelling in bicycle education, evaluation and enforcement,” says Steve Alberts, communications manager at the Texas Convention and Visitors Bureau. “Austin is the only city in Texas to earn this recognition.” Thanks to a recent partnership between the Capital Area Metropolitan Planning Organization and Armstrong’s Mellow Johnny’s Bike Shop, Austin’s bike-share program will launch in 2013 with 450 bikes located at kiosks in downtown and East Austin. For now, temporary bike-share programs are available during special events like the annual SXSW festival in March. And if you don’t have a bike and have trouble hailing a cab after the bars close, hop onto one of the city’s numerous pedicabs. “Drivers work for tips, and can point out the coolest nightspots,” says Alberts. Not long ago, Beantown was often cited as one of the worst cities for biking. Dismayed by the unsavory title, Mayor Tom Menino started the Boston Bikes initiative in 2007 headed by former Olympic cyclist Nicole Freedman. In the past five years, Boston has created over 50 miles of bike lanes (up from just 60 yards), installed 2,500 bike parking spaces and 850 bike racks, and established numerous city-wide programs to promote cycling and bike safety. The city recently ranked number one in the country for safety for bikers and pedestrians by the Alliance for Biking & Walking, and carries silver-level status as a bike-friendly community from the League of American Bicyclists. The New Balance Hubway bike-share program debuted in summer 2011, garnering 100,000 rides in the first 10 weeks. In 2012, Hubway plans to expand into neighboring Cambridge, Somerville and Brookline, and hopes to add even more stations in Boston proper. The Hubway bike-share system – with over 600 bikes and 61 stations – costs $5 for one day or $12 for three days. The first half-hour of your ride is free; then it’s an additional $2 for up to an hour, $6 for up to 90 minutes and $14 for up to 2 hours of riding. In his first year as mayor of America’s third largest metropolis, Rahm Emanuel laid out ambitious plans to “make Chicago the most bike-friendly city in the country.” To that end, “Rahmbo” has proposed a 500-mile network of bike paths, with at least one path within a half-mile of every Chicago resident. In the meantime, the city already boasts over 12,000 bike racks, more than any other U.S. city, and one of the best dedicated urban bike paths around: The 18.5-mile Lakefront Trail takes bikers through several popular parks and attractions, with sweeping skyline views around every bend. Several high-capacity bike parking areas are located throughout the city, including many of the city’s rail stations and at Millennium Park, where the state-of-the-art McDonald’s Cycle Center even offers showers and lockers. And when it comes to bike-share programs, things have never looked brighter for the Windy City: A system launched in 2010 by Chicago B-cycle consists of seven self-service bike rental stations at several popular Lakefront locations, and the city recently contracted with Alta Bicycle Share to make a whopping 3,000 bikes available at 300 solar-powered, self-service stations this year. 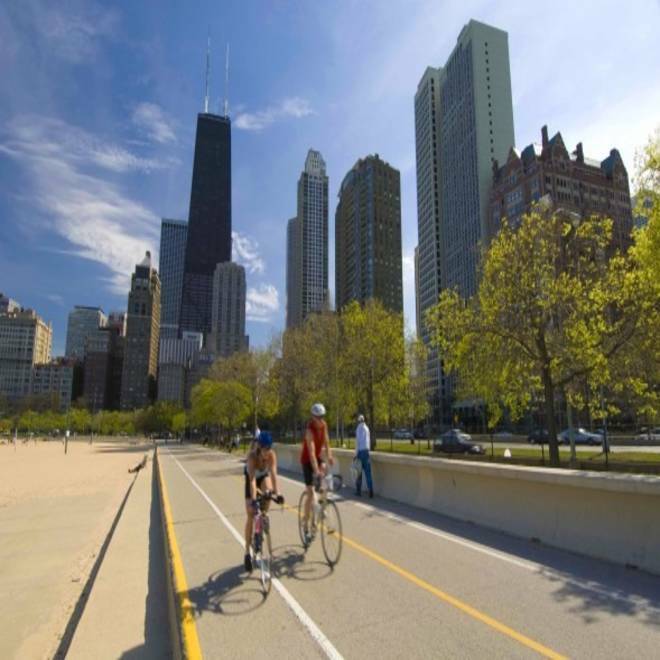 Bike and Roll Chicago has been operating on Chicago's lakefront for 19 years at top Chicago destinations such as Millennium Park, Navy Pier, Wabash & Wacker (across from Trump Tower), North Avenue Beach and historic Hyde Park (President Obama's neighborhood). Rates for one of their new Trek models start at $10/hour and $35/day (save $5 on the daily rate by booking online). The same company operates Chicago B-cycle, with rates starting at $5/hour and increasing by $2.50 every half hour; after 4 hours, the $20/day rate applies. “Though a bit off the standard tourist track, the Illinois Institute of Technology has world-class architecture that definitely makes a worthwhile visit…,” suggests Jeremy Rothschild, director of marketing for Chicago B-cycle. “The campus boasts several buildings designed by Mies van der Rohe, Rem Koolhaas and Helmut Jahn.” From Grant Park, travel south along the Lakefront Trail and make a right at East 31st Street, then continue a mile to the IIT campus, home of two B-cycle bike-share stations. “Biking is a great way to explore Denver,” says Katie Adamson, a public relations coordinator at Visit Denver. “Visitors can take a B-cycle to almost every major attraction in the city.” The B-cycle bike-share program, one of the first of its kind in the nation, provides access to the riverfront, the Denver Botanic Gardens, City Park, downtown shopping areas and the Golden Triangle museum district. The weather is great for cycling, too, with blooming trees and flowers in the spring, community bicycle events in the summer (www.bikedenver.org; www.denvercruiserride.com), and abundant fall foliage (B-cycle stations are closed from December to March). Denver has the added bonus of being 30 miles from Boulder, another great bike-friendly city. Denver’s smaller, outdoor-loving neighbor has its own, more extensive B-cycle share program and hundreds of miles of downtown bike lanes and mountain biking trails. Even the USA Pro Cycling Challenge, a year-old professional bike race on par with Tour de France, deems both cities excellent for biking. The seven-day race begins in southwestern Colorado, travels through several Rocky Mountain towns, including Boulder, and ends dramatically with a time-trial finish in downtown Denver. Free for spectators, the 2012 challenge will be held from August 20-26. The base day rate at Denver B-cycle bike share starts at $8, with reasonable usage fees accruing after the first 30 minutes: $1 for 30-60 minutes after checkout and $4 for each additional 30 minutes. You can pick up and drop off your B-cycle at any of the 52 stations around town (denver.bcycle.com). The Cherry Creek Bike Path, which is lined with cherry blossoms in the spring and includes the Cherry Creek Shopping District as well as Castlewood Canyon State Park and the Cherry Creek State Recreation Area (www.denver.org). 5. Minneapolis and St. Paul, Minn.
A 24-hour subscription to the Nice Ride bike-share program costs $6, after which you can ride for free for the first 30 minutes. Fees are $1.50 for up to an hour, $4.50 for up to 90 minutes, and $6 for each additional half hour after that (www.niceridemn.org).